There was a moment--actually several long moments--during the 1960s and 1970s when poets collaborated directly with militant and activist organizations. In particular, leading figures in the Black Panther Party (BPP) collaborated with leading Black Arts Poets on multiple projects. The poster embedded on the cover showcases a benefit sponsored by "The Black Arts Alliance" for the BPP held in San Francisco in 1967. As the poster notes, the featured speakers were Huey Newton, LeRoi Jones (later Amiri Baraka), and Stokley Carmichael. Although it's nearly faded now, the bottom reads that there will also be "BLACK DRAMA AND MUSIC." That special issue of The Drama Review included pieces by Baraka, Ed Bullins, Sonia Sanchez, Woodie King, Jr., Marvin X, and Larry Neal. It's worth noting that Neal's contribution "The Black Arts Movement" would become one of his most widely known and anthologized works; Neal's essay also gave the artists' activities a memorable name. The poster on the cover hints at the links between poets and political activists as well as the idea that poets were in fact activists. The presence of drama was also key in the associations between black arts poets and BPP members. 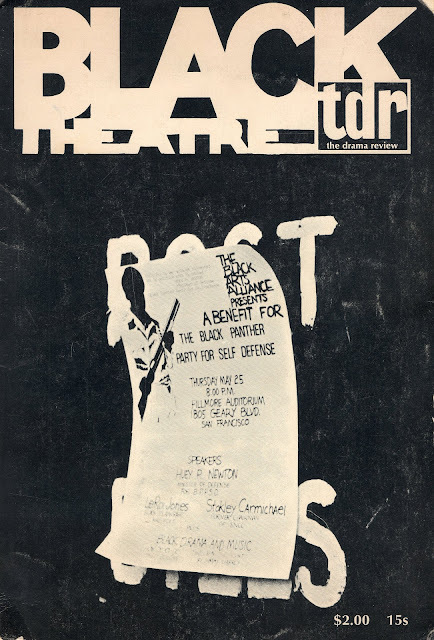 James Smethurst explains in his book The Black Arts Movement: Literary Nationalism in the 1960s and 1970s (2005) that prior to Bobby Seale's involvement with the Panthers, he acted in plays by Ed Bullins and Marvin X, both of whom were involved with black arts. Bullins and Marvin X also served as principle contacts for introducing Eldridge Cleaver to Seale and Newton. Thus, the black arts-sponsored event for BPP was keeping with some ongoing collaborations. Panthers and leading Black Arts poets eventually parted ways--not, by the way, on the best of terms. But they remained virtually linked through a distinct focus on black culture and shared approaches to drama in all kinds of public and activist endeavors.